While the result of the upcoming election appears to be a foregone conclusion, you can be sure about one thing: the lead up will feature policies by both parties that are riddled with hollow promises and unimaginative strategies. The nature of the policies is usually determined by how the parties are positioned in the home straight. Are they that far off the pace even a Winx style finish isn’t going to get them over the line? Or are they that far in front that even the mighty Black Caviar couldn’t run them down. With regards to areas of focus, it is already apparent that the issue of reliability and affordability of power supply will be up there as a priority. Interestingly, there is an ASX listed group in Simble Solutions (ASX:SIS) that is poised to benefit from the inability of either major party to resolve this problem. While we will look at the company in detail, first it is worthwhile examining political strategies in relation to addressing the issue of power supply and pricing, as these appear to be playing right into the hands of companies such as Simble. Shorten’s non-committal approach certainly smacked of a confident heir apparent when he rolled out Labor’s policy on how he would address the power crisis in Australia. Rather than produce any policy with near-term ramifications/solutions, he referenced the installation of solar batteries, doubling investment in the Clean Energy Finance Corporation and increasing electric car ownership by 2025. There was also the old chestnut about increasing power from renewables by 2030 – in true Labor parlance, ‘creating 70,000 jobs’. That gives Labor 11 years to forget about the policy and roll out its next potential election winning spiel a decade later. By comparison, Scott Morrison had to be far more near-term focused and give his voters something tangible to cling to at the ballot box. So Scomo just threw some money at the problem, but it is a real ‘cheque in the mail’ promise that still has to be passed in Parliament. Furthermore, if the cash handout is forthcoming it is likely to be spent on everything else other than power before the bill even arrives. Importantly though, particularly for a company such as Simble, neither Shorten nor Morrison could propose a strategy that will address the key issues of supply and affordability. It would seem that having the entire state of South Australia plunged into darkness despite having the most expensive electricity in Australia hasn’t inspired the politicians to do anything about the problem. Likewise, other statistics such as low wage growth, mortgage stress, declining house prices and ever-increasing power bills isn’t enough to get any meaningful and material relief from Canberra or state governments. Napoleon Bonaparte is credited with saying ‘if you want something done, do it yourself’. So, is it time for consumers to adopt Bonaparte’s approach? 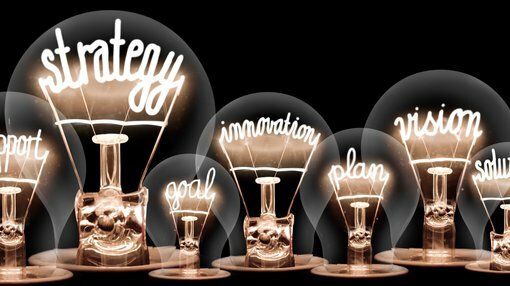 There is some help at hand in the form of an innovative emerging player in the Internet of Things (IOT) and Software as a Service (SaaS) industry sector. 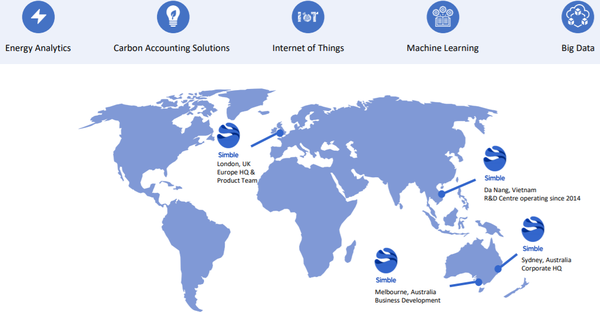 In simple terms, Simble Solutions is an Australian software company focused on energy management, and its technologies also have applications in terms of monitoring and addressing utilities usage. The Simble Energy Platform, or SimbleSense, is an integrated hardware and real-time software solution that enables businesses to visualise, control and monetise their energy systems. Simble’s Software as a Service (SaaS) platform enables enterprises and consumers to remotely automate energy savings opportunities to reduce their energy bills. The company operates in the small to medium enterprise (SME) and residential markets, targeting the distribution of its platform through channel partners. Such has been the success of its technologies that they have been adopted overseas where the company has enjoyed significant success in the UK. Simble had a major contract win in its UK operations in January which will see a minimum of 10,000 meters connected to the platform before the end of the June 2019 quarter. 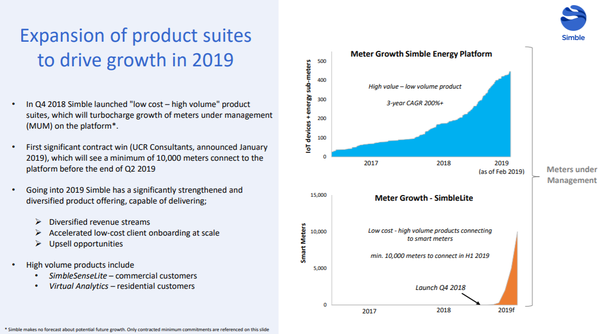 Since its IPO in February last year, Simble has announced contracts and orders worth up to $4.9 million from its partners including BidEnergy and Synnex in Australia, and Powercor and Utiligroup in the UK. Clients using the group’s energy solutions technologies also include major ASX-listed corporations such as Macquarie Bank (ASX:MQG), Caltex Australia (ASX:CTX), Downer EDI Ltd (ASX:DOW) and DuluxGroup (ASX:DLX). Corporate clients based outside of Australia include Bayer AG (ETR:BAYN) and Ferrero Rocher. Simble has also received corporate support at a shareholder level with Westpac Banking Corporation (ASX:WBC) emerging as a substantial shareholder in February with a stake of 5%. 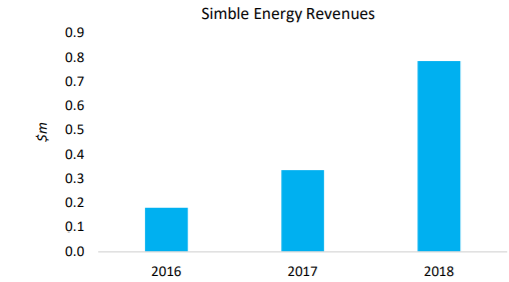 Not only is Simble boasting big name signings, the company is also generating strong income growth with the Simble Energy division increasing revenues by 134% to $785,000 in the 12 months to December 31, 2018. The key driver behind this growth was a 241% increase in customer sites on the Simble Energy Platform. 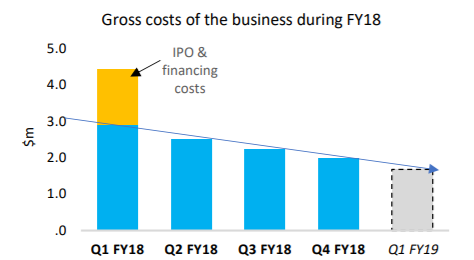 The other key factor to monitor, particularly with smaller companies trying to establish a position in new markets is the drag on capital due to research and development expenditure. This reduced by 70% between the March quarter and the December quarter of calendar year 2018. In delivering this financial performance, Simble achieved key prospectus target of expanding distribution channel partnerships and investing in research and development, laying the foundation for sustainable future growth. Simble recently entered into marketing partnership agreement with Australian group BidEnergy Ltd (ASX:BID) to commercialise a bundled technology solution comprising of combined intellectual property. It will involve one of the councils commencing their first 500 gas, water and electricity accounts on BidEnergy’s platform, making Simble part of the solution for multiple utility services. Given that gas is another arm of the energy sector, and issues such as droughts have placed pressure on water supplies, the company should benefit from its ability to provide services across other utilities. As indicated below, the company’s outlook for 2019 appears strong, with the potential for further opportunities to emerge in Australia as both consumers and businesses examine ways in which they can achieve better efficiencies and more economical outcomes in terms of power supply.